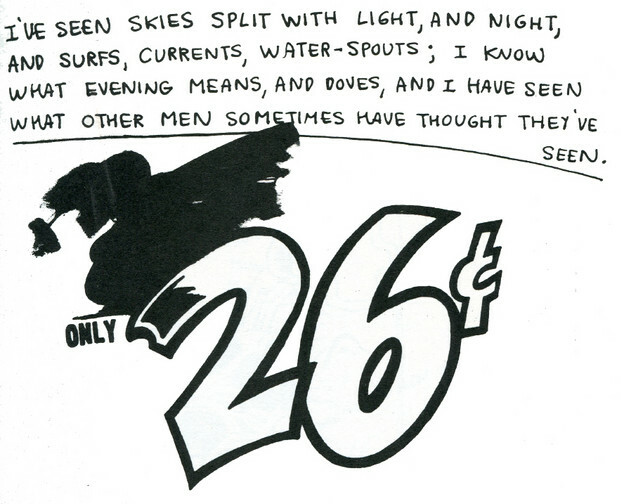 Ted Berrigan’s “The Drunken Boat” — a mimeograph publication from 1974 with drawings by Joe Brainard — exemplifies a different type of insouciance towards the source text than any we’ve seen thusfar. Berrigan passes off his seemingly straight, utterly conventional translation of Rimbaud’s “Le Bateau Ivre” as his own work. He calls his translation a “homage” to Rimbaud — which, while usually a humble gesture acknowledging influence and gratitude, in this case could be possibly interpreted as a form of naked aggression and erasure. We could just as well say, however, that this appropriative gesture is meant to affirm that a well-done translation is an art in its own right, rather than a secondary pursuit. After all, in its directness and energy, to me it is probably one of the best translations of “Le Bateau Ivre.” But this directness is a deceptive one, given its circuitous itinerary in Berrigan’s oeuvre. Since his translation, written as early as 1962, is roughly contemporaneous with the Sonnets, this mimeo is maybe a retrospective homage, meant to refer back to all the ways in which Berrigan’s poetry had been infiltrated by Rimbaud’s green waters in the years between 1962 and 1974. The Sonnets, in themselves, challenge translational integrity, even at the basic, formal level. Are they actually sonnets? They also contain within their sonnetesque frame a patchwork of quotes and citations, phonetic translations and collage fragments, including outright remixes of “The Drunken Boat” drawn from this at-the-time unpublished (and still widely unavailable) translation. But, at the other end of this process of fragmentation, recombination and incorporation, if this reconstituted “The Drunken Boat” is now by Ted Berrigan, it is more remarkably drawn by (neither illustration nor interpretation but direct, original emanation) Joe Brainard. Compared with the closeness of Berrigan’s translation, these drawings are exceedingly oblique, in addition to appearing only partly finished — the undoing of the poet meeting an undone aesthetic. Brainard smatters his hand-lettering of the poem with tracings from the imagery of the supermarket — but no real pattern emerges. They are merely haphazard, unfinished sketches of price tags, logos, kitchen patterns, gossip magazines. Any attempt to provide a reason for the presence of these absurd inclusions might imply a structure of reference that is much too neat, although they are in line with the absurdity and irreverence of Berrigan’s other image-text collaborations with both Brainard and George Schneeman. However, it is striking that these pointedly domestic images are placed in the midst of a terrible baptism beyond the realms of civilized comforts. The first image — a bandage with the words “this bandage has an OUCH!” (explicitly playing on the paradoxical Bandaid promise of “ouchlessness”)—is followed by a silhouette of an iconic housewife. Is this an excessive instance of the kind of “domesticating” translation that Lawrence Venuti and others have critiqued or just the opposite . . . domestic imagery utilized for the purposes of making-strange? We could say that Brainard’s intersemiotic translation of Rimbaud or of Berrigan is posited as a kind of overcoming of Rimbaud, or maybe, more aptly the overcoming of his cult. These images place Brainard in some kind of debate not only with the machismo of Rimbaudemianism but also with the notions of artistic completion and mastery itself. This aestheticization of ineptitude could, admittedly, be an easy out for most artists; although as a kind of "getting over oneself," Brainard's drawing practice harbors a potential social project, allowing for new relations. 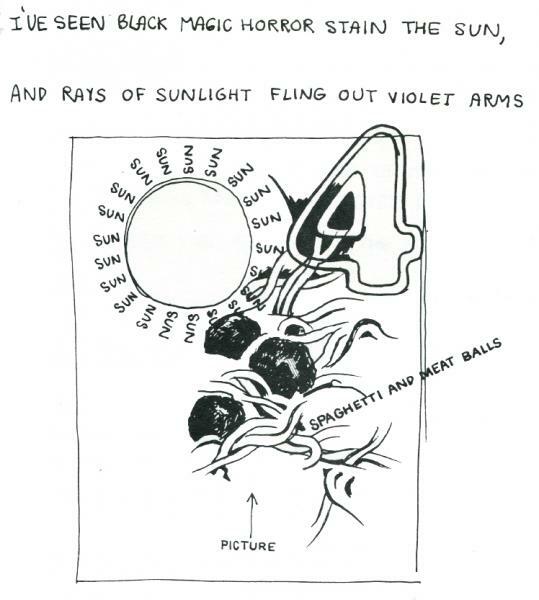 We could compare, for example, Willem De Kooning’s drawings of Frank O’Hara poems. The loose representativeness of DeKooning’s abstract expressionism responds to the “deformalized personal relations” (Bill Berkson’s term) of O’ Hara’s aesthetic, opening up an informatic field of play rather than a aesthetics of capture. And in this way, the poem invites its own deterioration — tied more to the existence of the writer as trace and tracer than as conservator and translator. Rimbaud’s poem starts with the overthrow of the “haleurs” — masters, bargemen, merchants, but more literally, merely “haulers”—and ends with the sad child surrendering his bateau frêle comme un papillon de mai. So while this drunken, drunken boat becomes a metaphor directed towards indiscriminate, commercialized, supermarket translation carrying its cargo of meaning without passion — with Berrigan displaying the hauteur of one nailing up less skillful haleurs for target practice — it is the poem's more inward child, eyeing the world from the shopping cart seat, that is also rescued here (many times forgotten in the transmission of Rimbaud’s verbal bravado). 1. Venuti argues for translating work that culture jams the host language, and in that sense most translations of Rimbaud have functioned to jostle the canon and literary propriety. Yet by 1974 the function of Rimbaud to shock and provoke may have been thoroughly institutionalized, or the sobering experience of the Vietnam War may have changed the optics for Rimbaud's mystic horrors.